In 2009, President John Delaney, reaffirmed this commitment by selecting Community-Based Transformational Learning (CBTL) as UNF’s Quality Enhancement Plan (QEP), a keystone in UNF’s reaccreditation effort. This five-year $3.2 million initiative aims at diffusing community-based learning throughout UNF’s academic and co-curricular programs. UNF created the Center for Community-Based Learning to implement its QEP. Since 2009, the Center’s staff has grown from 3 FTE to 5.5 FTE and several graduate and Federal Work Study students dedicated to support faculty and staff in CBTL course and program development, manage community-university partnership development and help departments infuse CBTL into curricula. The Center directs the Community Engaged Department Institute and Grant Program that enables academic departments to revise curricula incorporating CBTL. They also manage the Community Scholars Program for faculty and staff interested in CBTL. As of today, 38% of academic departments added community engagement to their curriculum through the Engaged Departments program and 35 faculty and staff have participated in the Community Scholars Program. In 2012-2013, the Center also unveiled several new student service programs, including the Osprey Community Ambassadors and Community-Based Undergraduate Research Partnerships programs. In addition to programs offered by the Center, the University has several curricular and co-curricular departments that implement community-based projects. A cross sample of engagement efforts are included below. Since 2005, UNF has invested $1.75 million to support programs linked to “the civic and economic needs of the Greater Jacksonville community.” In 2005, the School of Nursing was awarded $369,000 to create their “Community-Based” nursing program to embed nursing faculty and students in community settings in some of Jacksonville’s highest heath risk neighborhoods. In 2010, the “community-based” program and Mission House, a community partner, received Florida Campus Compact’s “Campus-Community Partnership Award”. UNF’s College of Education and Human Services’ Urban Professional Development School Partnership with Duval County Public Schools places clinical faculty members in four schools to assist UNF students in their field placements and as “professors in residence” for Duval school faculty development. In 2009, this program received the National Association for Professional Development School’s “Professional Development School Achievement Award.” In 2012-2013, students in the School of Engineering provided 37,900 volunteer hours to the community through a variety of community outreach initiatives, both curricular and co-curricular. UNF implements CBTL through five “gateways.” They are: volunteering and outreach, community-based instruction (service-learning), apprenticeships (field-placements, practica and internships), immersion programming (alternative spring breaks and some forms of study abroad) and community-based research. These gateways leverage multiple university assets and link community engagement across the academic curricula with co-curricular activities. The gateways provide intentional pathways for UNF students. During 2012-2013 nearly 50%, or 8,043, of all enrolled undergraduate and graduate students participated in at least one community-based course or activity. All of these activities have led to UNF earning several university-wide designations and awards. In 2010, UNF received the Community Engagement Classification from the Carnegie Foundation for the Advancement of Teaching in recognition of the University’s exceptional commitment to community engagement. UNF has also received the President’s Higher Education Community Service Honor Roll each year since 2010. 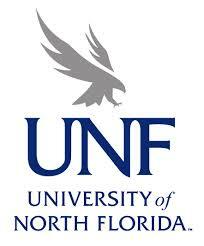 As a regional university, UNF significantly impacts the community. UNF provides a strong, well-trained workforce for local employers and provides volunteer, service-learning and internship support to numerous nonprofit organizations. Through UNF’s Volunteer Services and its fraternities and sororities, the community also benefits from hundreds of volunteers and thousands of donated dollars. UNF’s current President, John Delaney, a former mayor of the City of Jacksonville has uniquely positioned UNF to address some of the critical social and economic issues facing the Greater Jacksonville area: racial and health disparities, neighborhood safety and security, increasing educational disparities, gaps in wealth creation, to mention a few. By creating sustainable, community-based programs across the university UNF students learn and are transformed by high-impact learning experiences in actual, real world situations and fulfill its responsibilities as a public institution.